My new fabulous yard offers a plethora of wonderful backgrounds for blog photos. Observe the antique shed. Could look urban or rustic. Very versatile. Next we have this lovely wood fence with accompanying...what is that called anyway? Chicken wire? Vine latice? Obviously some sort of hybrid of the two - there is vine growing on it nonetheless. Okay, okay - this isn't a blog about my yard. Let's get to the sewing. The shirt dress was the first thing checked off my September to-do list. 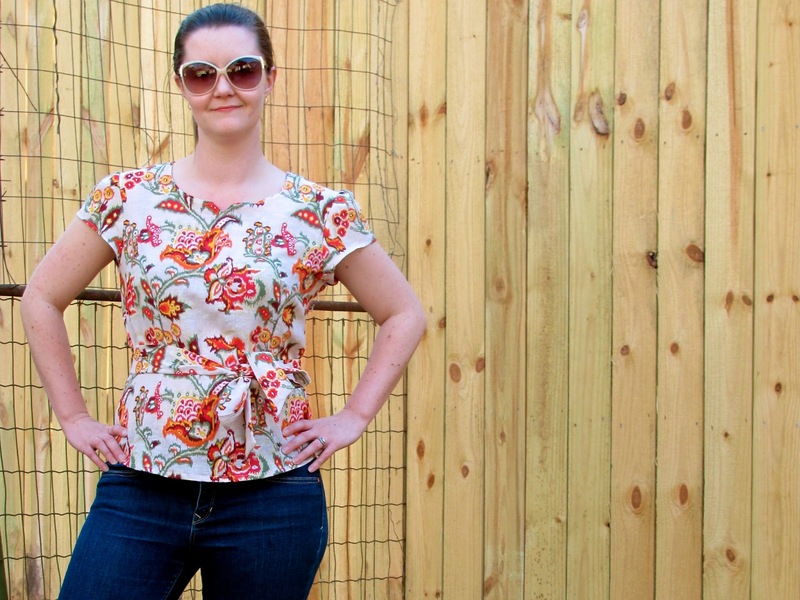 This Alma Blouse from Sewaholic Patterns was the second. I have a long torso - so belts don't always look right look ridiculous on me when I tuck my shirt into my pants. Unless the pants are high waisted, (which is supposedly in style, and yet I can't seem to find anywhere.) In sum: I'm always looking for shirts I don't have to tuck in. 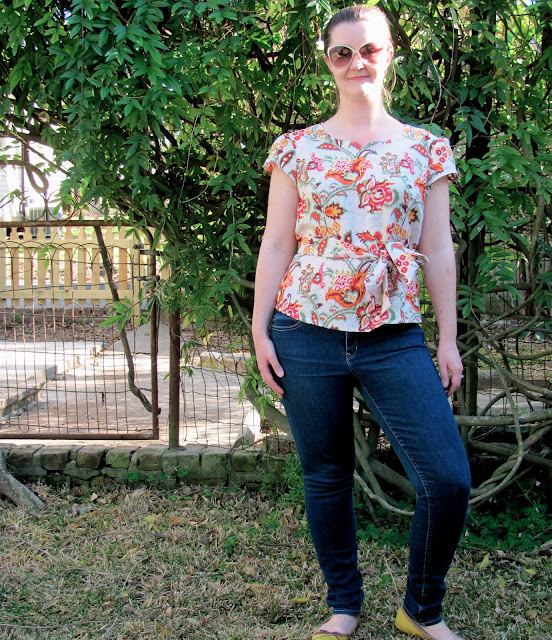 I love the Alma Blouse because it has a tie belt and thus, no tucking. Stats are below. Time: A weekend. It was a slow start. Other interesting facts: There is a zipper in the side. Changes for next time: I will add and inch to the torso length. I had never done a Sewaholic pattern before - although I have loved Tasia's blog for a long time, especially when she writes about running her own business. My secret fantasy! This shirt also reminded me how I never quite put an invisible zipper in perfectly. There is always some weird little gap or bunched fabric. I'm determined to get it right in my next project (Colette's Clover pants) even if I have to hand pick the thing!